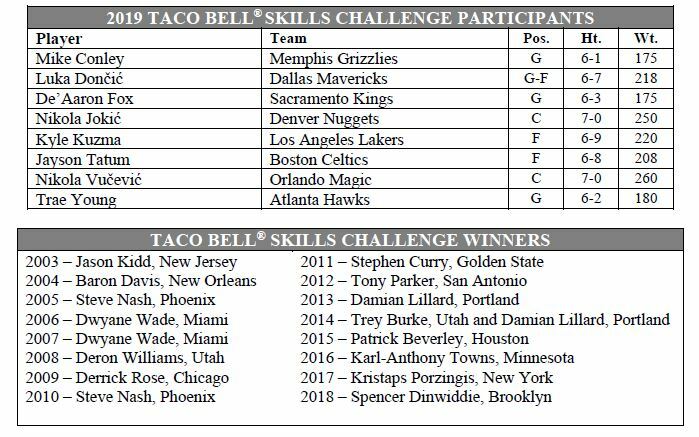 NEW YORK – First-time NBA All-Stars Nikola Jokić of the Denver Nuggets and Nikola Vučević of the Orlando Magic and reigning Kia NBA Rookies of the Month Luka Dončić of the Dallas Mavericks and Trae Young of the Atlanta Hawks will display their vast array of talents in the 2019 Taco Bell® Skills Challenge on Saturday, Feb. 16 at Spectrum Center in Charlotte, North Carolina. Mike Conley, Grizzlies: Conley (20.3 ppg, 6.3 apg) is averaging at least 20.0 points and 6.0 assists for the second time in the last three seasons. He is a two-time winner of the NBA Sportsmanship Award. Luka Dončić, Mavericks: The Slovenian guard-forward (20.7 ppg, 7.0 rpg, 5.4 apg) has won all three Kia NBA Western Conference Rookie of the Month awards this season. The only rookie to reach Dončić’s current averages in points, rebounds and assists for a full season is Oscar Robertson in 1960-61. De’Aaron Fox, Kings: One of the NBA’s fastest players, Fox is averaging 17.5 points and a team-high 7.2 assists (ninth in the NBA) – up from 11.6 points and 4.4 assists as a rookie last season. He has already made more three-pointers this season (56) than he did in his entire first season (47). Nikola Jokić, Nuggets: The 7-foot center from Serbia leads Denver with averages of 20.1 points, 10.4 rebounds and 7.7 assists (sixth in the NBA). He ranks second in the NBA in triple-doubles with nine. Kyle Kuzma, Lakers: Kuzma (18.8 ppg) is the third-leading scorer among second-year NBA players and paces the Lakers in three-pointers made with 91. He was a 2017-18 NBA All-Rookie First Team selection. Jayson Tatum, Celtics: Tatum is Boston’s No. 2 scorer (16.1 ppg) and rebounder (6.2 rpg). The 2017-18 NBA All-Rookie First Team selection has shot 40.4 percent from three-point range over two seasons. Nikola Vučević, Magic: A first-time All-Star in his eighth season, Vučević is averaging career highs of 20.7 points, 12.0 rebounds (10th in the NBA) and 3.8 assists. The 7-foot Montenegrin center is shooting a career-high 37.8 percent from three-point range. Trae Young, Hawks: The Kia NBA Eastern Conference Rookie of the Month for October/November and January leads all first-year NBA players in assists (7.4 apg) and ranks second in scoring (16.8 ppg). He is averaging 24.0 points and 8.5 assists in his last six games.